In discussion replies, a blue dot indicates the reply is new and unread. A white dot indicates a reply is read. When you navigate away from the discussion or refresh the page, the blue dots will change to white dots indicating the replies are read. You can tell Canvas not to automatically mark your discussion replies as read so that you can manually control which replies you haven't viewed. 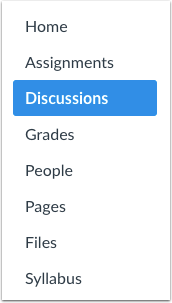 Your selection for this option will apply to the Discussions settings for all of your courses. By default, manually marking posts as read is turned off. You can manually mark discussion replies as read or unread at any time. Click the Manually Mark Posts as Read checkbox. 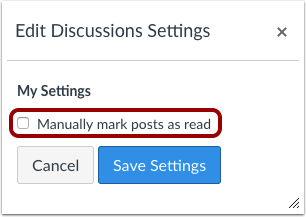 Note: Selecting this option will require you to manually mark posts as read for all of your courses. Previous Topic:How do I view and sort discussion replies as a student? Next Topic:How do I mark discussion replies as read or unread as a student? Table of Contents > Discussions > How do I change discussion settings to manually mark discussion replies as read as a student?